Lead conversion is the act of moving a lead one step further through your sales funnel – examples include converting a prospect from a lead to a sales meeting, to an opportunity, or even to a customer. Because the term “lead conversion” and “conversion rate” isn’t specific on its own, it’s best to specify which stages you’re referring to when discussing conversion rates and strategies in your work. How to Measure Lead Conversion? With your sales funnel mapped out in clearly defined stages, it’s much easier to spot where you can make the most improvements to win more customers and implement the right lead conversion strategies to do so. As your database of leads grow, you’ll want to be able to score your leads based on their potential value and how likely they are to convert. Using lead scoring can help your team prioritize which leads are worth spending time working and which to go after first. In its simplest form, bad ICP leads are leads who you shouldn’t enter into the sales process (not likely to become a customer, likely to churn, etc). Good ICP leads are leads who meet a minimum set of requirements you set on who can enter the sales process. The next step is to implement a lead scoring system to rank leads who do meet your ICP. There are two main categories of criteria you can score: firmographics and intent. Firmographics scoring is measuring the fit of the company, similar to the ICP criteria above. Intent scoring is an attempt to measure their level of intent to buy. We recommend to keep these scores separated by using a letter grade for their firmographic score and a number grade to measure their intent. Bad ICP leads get a score of “F.” Good ICP leads can be given a score from “D” to “A+”. As the score gets higher, the leads should be both a better fit (more likely to see value and therefore more likely to become a customer) and have higher potential revenue. If you set up lead scoring in this way, you can see just by looking at a lead’s score how like they are to convert. For example, a lead with a score of A220 is likely a good candidate for sales to reach out to. A lead with a score of C15 may be a better fit or automated email campaigns. Now that you’re able to determine which leads are a good fit and most likely to convert, we can now look at some strategies to do so. There’s typically two core situations where you convert leads, outbound and inbound, and they require very different approaches. Let’s start with outbound. Outbound is defined as lead conversion activities toward leads who haven’t requested a demo, info about your product, or for sales to contact them – they need to be sold to. When discussing the topic of lead conversion strategies, we’re specifically aiming at converting known leads into the next step in your sales process, whether that be a sales meeting or straight to customer. If you need to get more leads, check out our ultimate guide to B2B Lead Generation. Now that you’ve identified your good fit leads and assigned them a score, you can create lead lists to give to your sales team. With a LinkedIn Sales Navigator account, your sales team can pull up all the employees on LinkedIn at your target accounts and find the exact people to contact. We use LeadIQ to find their phone numbers and stick them in SalesLoft to manage our outreach to them. Through cold emailing and calling, we convert 4.5% of our leads to sales meetings and we’re improving our efficiency every month. Direct Mail (DM) campaigns involve sending target leads a physical mailing or package in order to invoke a response. DM campaigns are a great way to get your leads’ attention by standing out from all the other sales people hitting up their inbox every day. At Chili Piper, we recently launched our first direct mail campaign. We hand selected 100 target accounts and two leads from each company to send a package to. The most successful DM campaigns involve some creativity to be different, fun, and anything but boring. 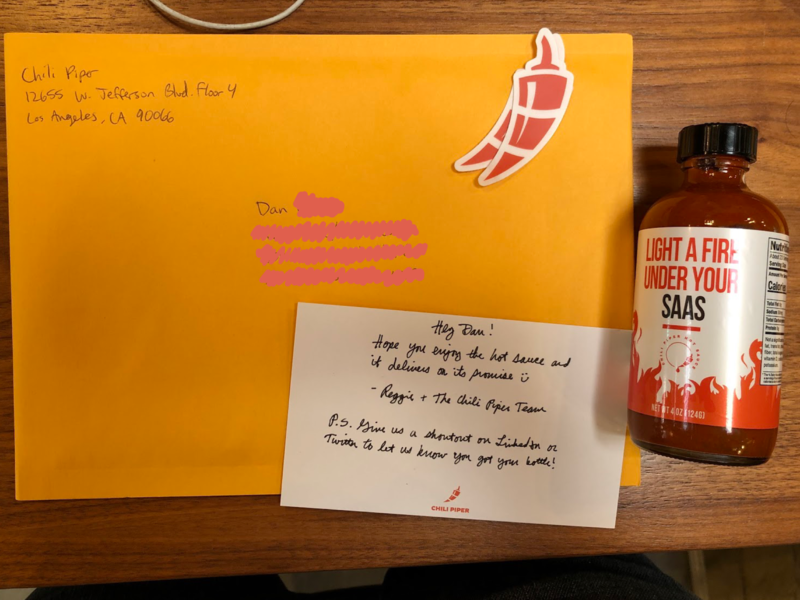 Because we’re Chili Piper, we couldn’t send anything less than our own branded hot sauce. Pair a DM piece with a sales cadence – emails before and after the expected arrival of the package. You can consider a DM campaign successful if your lead conversion rate is higher than the conversion rate of your cold outbound activities. In addition to cold sales activities, you can also take a list of your best leads and upload them to Facebook and LinkedIn to run targeted ads to those specific people. To make this work, you’ll need a list of at least 1,000 people to meet their minimum custom list size requirements. Typically, LinkedIn is the best bet for B2B, but don’t count out Facebook. Leads are leads and buyers are buyers no matter what channel they’re on – you just need to find the right targeting and messaging to make it work. Targeted ads can be used in a variety of ways. First, you can launch ads with the objective of immediate conversion – a request to speak to sales for example. If your audience is really cold, that may not be the best approach. Another strategy is to run ads promoting top and middle-of-funnel content to warm the lead up. Through this type of advertising, you can make your best leads aware of your brand and the problem you solve. 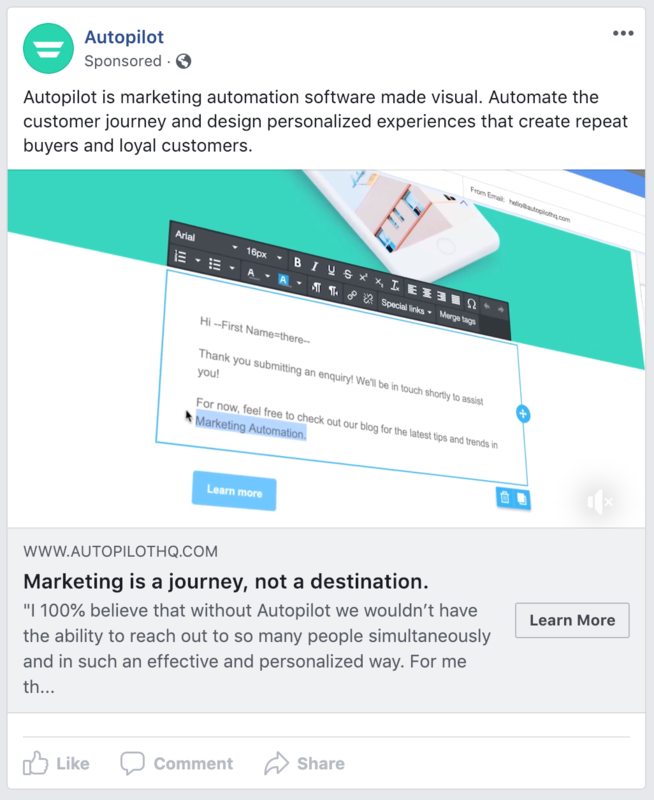 You can then retarget the people who engage with those ads with a “request to speak to sales” ad or have your outbound sales team reach out to those same people in hopes of improving your cold outbound lead conversion rates. Targeted ads can be expensive, but an excellent option to scale lead conversion once you find a winning strategy. An inbound lead is someone who comes to you asking to take the next step in the sales process. But the work isn’t over yet! If you don’t have a self-serve lead intake model, you still need to get in contact with your inbound leads, set up the sales meeting, and ensure they don’t no show. Although it’s much easier to convert leads who come inbound than outbound, not all convert so you need to have a system in place to maximize your inbound lead conversion rate. We recommend creating an internal inbound lead SLA with your sales team. An SLA stands for service level agreement and is simply a formalized and fully agreed upon process and cadence between the sales and marketing teams for following up on inbound leads. For example, as soon as an inbound lead submits a “request a demo” or “contact sales” form, the sales team agrees to email and call the lead within 15 minutes for leads submitted during business hours. If after hours, the sales team agrees to call and email and every inbound lead before 10 AM the next business day. An example for the marketing team could be they agree to manage the lead routing system, notifications to the right sales reps, and sending an immediate and automated “thank you” email to the lead. Creating an SLA between marketing and sales helps establish alignment between the two teams, which will lead to more efficient work and higher inbound lead conversion rates. Offer your inbound leads the ability to schedule their own sales meeting as soon as they fill out your form – while they’re still hot. Self serve meeting scheduling is one of the most efficient ways to convert leads coming inbound because your leads don’t have to wait for a salesperson to connect with them. If you’re new around here, that’s exactly what Chili Piper does. We integrate with your form and your sales team’s calendar to offer your leads the ability to schedule their own meeting when one of your reps are available. You can also choose to only give leads the scheduling option if they meet your ICP. This is especially useful for improving your conversion rate on leads that come inbound after hours and on the weekends. 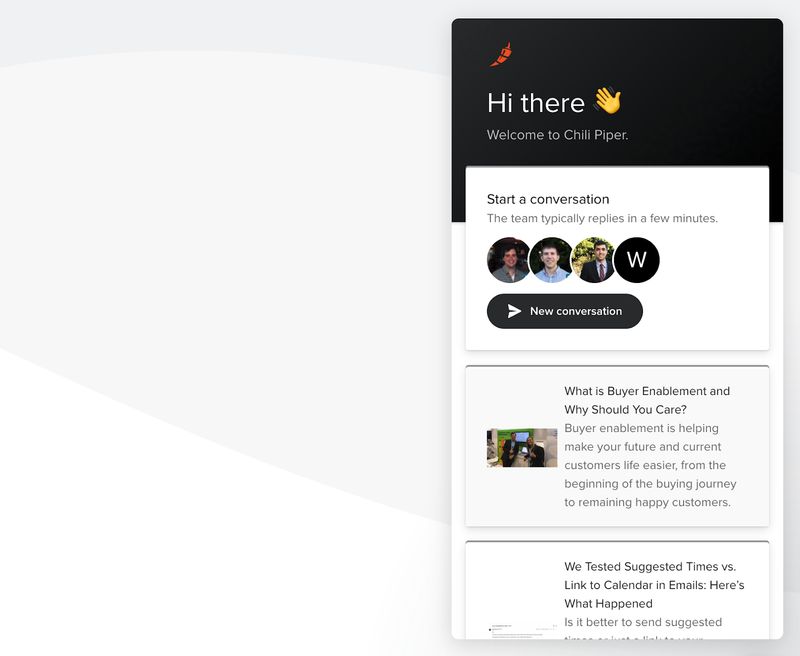 See what else Chili Piper can do to improve your lead conversion rate here. 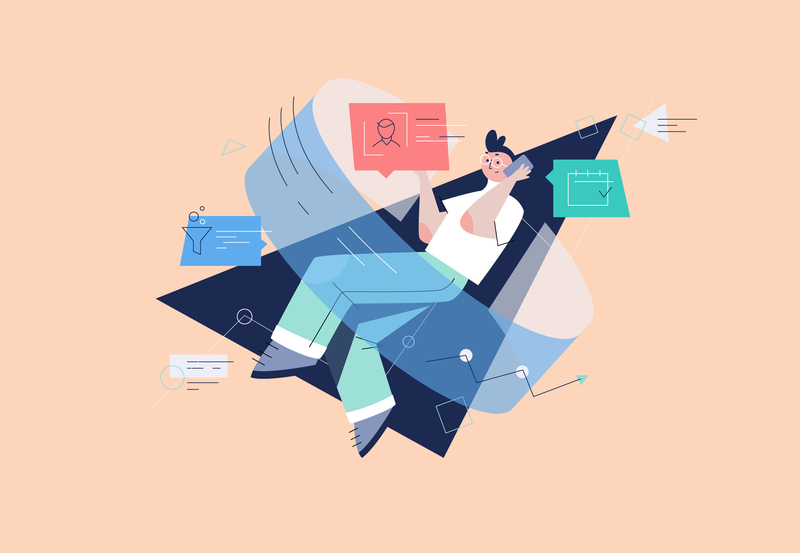 When an inbound lead submits your form and lands on your thank you page, you can pop up a chat conversation to let leads talk to a sales rep immediately – again while they’re still at their hottest. Sometimes leads don’t want to speak to someone on the phone and they’re comfortable using chat. They may need a few critical questions answered before they’re willing to get on a demo or speak to a sales rep. Offering your leads chat enables your leads to start a conversation with your sales team almost instantly and therefore increasing the probability of converting the lead. At Chili Piper, we take a passive approach and simply ask if they have any questions. It’s a fact you won’t be able to connect with and convert every lead, even the ones that come inbound and request to talk to you. Either the lead is fake, they submitted bad contact info, or your sales rep simply could connect with them. For the latter, it’s a good idea to have an automated system in place to bring old leads back from the dead. We recommend using an automated email sequence that emphasizes the problem your product solves. You may need to resurface the pain and challenges they once had at top-of-mind to restart the conversation with you again. If that doesn’t succeed, put them into a list every few months or so and create a special follow-up cadence for your outbound team to work using their previous inbound activity as context for the outreach. In summary, you need to define what good and bad fits are, implement lead scoring, and build reports to measure current and future lead conversion rates. Once these are in place, you can then focus on fine tuning your strategy and process for converting both inbound and outbound leads. Once these foundations are in place, you can spend more resources on lead generation activities to grow pipeline and your revenue.